Waiting for the ferry to Islay was never better. Since May 2008, Grahame Petit runs the Small Isles Catering business next to the Feolin Ferry Terminal. Whether it’s a coffee, tea or a delicious snack, Grahame can make the waiting comfortable and tasteful. I met Grahame on Jura early May, it was the 5th, on a glorious day and had a conversation with him. Grahame told me his new business was doing really well. 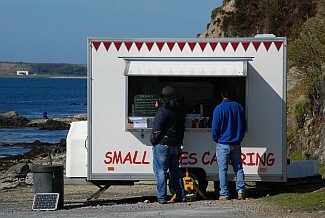 More and more people find their way to the “Small Isles Catering” and enjoy his delicious snacks and drinks. Grahame also runs Small Isles Photography and has a gallery and shop in the building next to the Feolin Ferry terminal. When you’re on Jura next time it’s very much worth while to stop at the gallery and walk up to his catering van for a coffee or snack.